Getting There: A,B,C,D,E,F,M to West 4th St. – Washington Sq. ; 1 to Christopher Street – Sheridan Sq. The farm-to-table movement has been in full-effect in New York City for a number of years now. So many in fact that the concept is often regarded as ho-hum. But before you continue that sarcastic roll of the eyes, consider sitting down at one of the tables inside Rosemary’s, a lively West Village restaurant that sits on a scenic corner and proves an unparalleled ability to execute an inventive idea. We’ll pretend for a moment that you aren’t in the know- that news of the fresh produce being cultivated on a small farm on the restaurant’s roof has somehow passed you by and that these locally produced ingredients are quite literally delivered from farm to table. The trattoria-like setting meanwhile paints a similarly consistent setting with strands of light bulbs strewn across the ceilings overhead and casual rustic feeling wooden tables situated in the main dining room. The addition of exposed brick walls and ample plant life on display enhances the place’s approachability, though their penchant for reservation-free dining supresses that some. The bar area is fittingly designed with intermingled wooden panels, woven together like a picnic basket beneath its granite countertop where the restaurant’s run of $40 bottles of Italian wine are whisked out to the thirsty dinner crowd. Interestingly, Rosemary’s lacks a true liquor license- but their handful of beer and wine infused cocktails offer one of the tamest (and finest) takes on the “Michelada” ($10) that we can recall. The menu meanwhile is decorated in rustic Italian fashion- one page long, a dazzling array of basic meats, cheeses and focaccias, and less than a dozen of their house made pastas and entrees which allows you to focus rather than be overwhelmed by a multitude of options. Eschewing the $6 helpings from the ‘Verdure’ section, featuring the likes of “Warm Olives” and “Eggplant Caponata,” we dig into a diminutively sized selection of ‘Formaggi’ ($5 each). 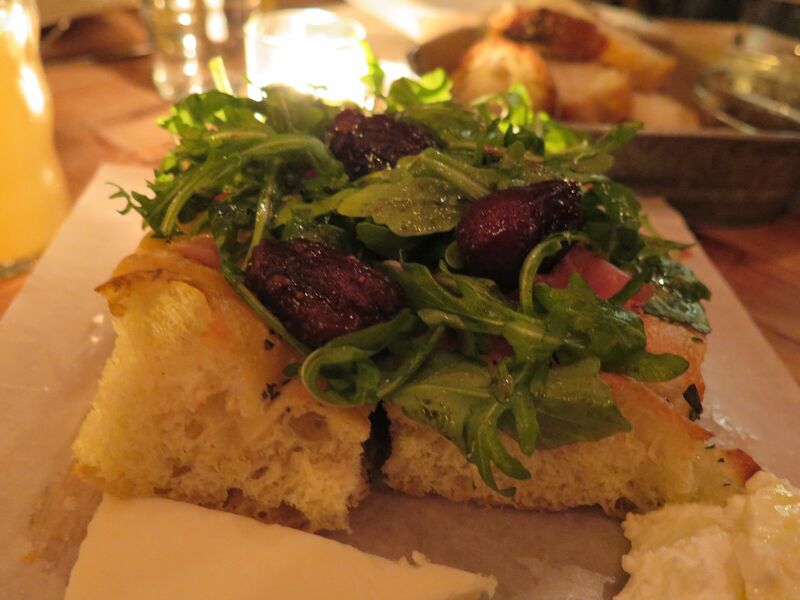 Our disappointment over the portion size aside, the silky “Ricotta Fresca” and stronger “Pecorino Toscano” were fine compliments to the salty slices of “Soppressata” ($9). But nearly everything was enhanced by the small side of sticky honey and fragrant rosemary plated beneath a basket of fresh bread, subtly dropped at our table- even the sweet-meets-savory “Fig and Proscuitto” Focacce ($11), a thick fluffy serving topped with arugula, balsamic and shreds of salty meat. 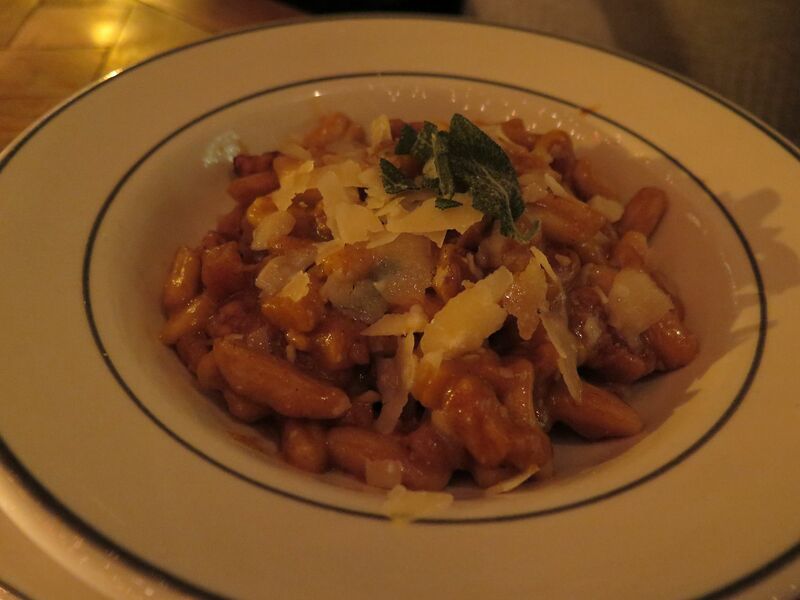 Considering the recent drop in temperature, the homemade “Cavatelli” ($14) was a no-brainer, adorned with walnuts, deliciously seasonal butternut squash and immersed in sage brown butter. The combination of perfectly prepared pasta bites amid a rich and flavorful broth-like sauce paired together admirably. Similarly savory, the “Pappardelle” ($18) house special was a more traditional Italian dish. The long flat strands of fresh al dente ribbons were lacquered with a ripe red tomato sauce with a chunky ragu and garnished with flakes of Parmigiano Reggiano for flavor contrast. Starch-loading made way for a generous portion of “Smoked Lamb” ($24) deliciously braised atop a bed of creamy ricotta and brown butter. The hunks of tender meat paired with the bitterness of grilled red radicchio, smoked onions and a sweet side of roasted fruit. The dish, appropriately sized for sharing technically seemed more short rib than lamb, but the flavors were particularly tasty nonetheless. Surprisingly, the evening’s can’t miss dish came by way of dessert, where Rosemary’s’ “Bombolini” ($9) was absolutely sensational. The basket of lemon ricotta donut holes was doused with white sugar, served warm and served beside a small dish of chilled Nutella cream- a lip-smackingly sweet and decadently capper to a hearty Italian meal. Even if you don’t have the opportunity to check out the rooftop farm at Rosemary’s, you could do a lot worse than reveling in the restaurance vibrant atmosphere downstairs. Though you certainly take a bit of a risk by dropping into a restaurant for dinner as a required walk-in, there is no shortage of noteworthy bars within two minutes of walking distance should the wait be overly excessive. Like most things worth waiting for, Rosemary’s is most definitely worth it.